Some of the nationalists handed out copies of an article from a Manila newspaper “proving” that the case had received a lot of publicity in the Philippines. 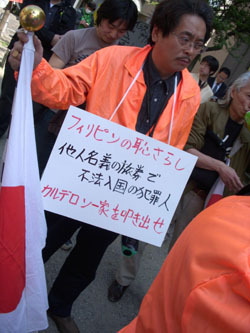 “Filipinos now know that if they have a child illegally in Japan, the child will win special rights,” said Takehiro Tanaka. Noriko Calderon, the unwitting target of all this attention, would have heard Sakurai from the cramped Warabi apartment she shares with her Filipino parents. But she was miles away with her mother, thanking supporters who had backed their fight to stay in Japan. Last month, the family’s six-month legal battle ended when Justice Minister Eisuke Mori gave Noriko a one-year special residence permit, allowing her to live with her aunt and continue school in this city. Her parents, Arlan and Sarah, who came to Japan in the early 1990s on false passports, were sent back to the Philippines on Monday. The twin demonstrations resonated far beyond these narrow streets and again threw Japan’s conflicting attitudes toward immigration into sharp relief. Nationalists say they represent the nation’s silent majority, which fears that the foreign hordes are set to trample through Japan’s carefully built legal barricades. Most view the Calderon case as a wedge issue, the latest in a series of signs that Japan is preparing to invite millions of foreigners to replenish its declining population. Politicians and business leaders have recently floated the idea of increasing immigrants from about 2 to 10 percent of the total population, but so far have failed to match that with hard policy. Japan’s dismally performing economy has knocked these plans back: Many immigrants are returning home. News that the welfare ministry is effectively bribing foreign factory workers to return to South America has incensed pro-immigration activists, as reported in these pages last week. 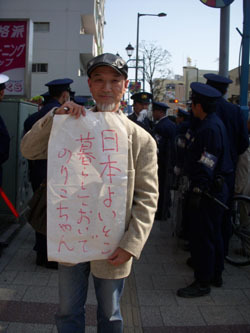 Demonstrator Iori Uchida said he would allow “limited” numbers of immigrants in depending on which country they come from. “Europeans and Americans are acceptable, but not Koreans or Chinese. Wherever Koreans go they cause 100 times more crimes than other races,” he said, a claim with no basis in fact. Although viewed around the Warabi streets as extremists, the nationalists claim they are swimming with the popular tide. Some point to the popularity of nationalist-themed comics like the best-selling “Hate Korea” series, and praise the ministry of education for last week authorizing a revisionist high school textbook that the Seoul government says whitewashes Japanese war crimes. 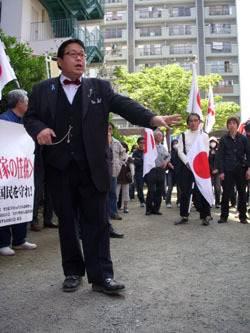 Sakurai is a leading proponent of the revisionist view in books and articles, arguing that Japan led the liberation of Asia from white colonialists. While his views might relegate him to the margins of commentary in other countries, he is a semi-regular pundit on TV shows here.